Arts and Cultural Alliance of Sarasota County » Why teach using arts integration? Have you ever danced your way through the digestive system, or demonstrated the solution to a math problem using your body? How about telling the story of suffrage by bringing a tableaux –frozen picture– to life using drama tools? Well, if you haven’t, then you need to experience an arts integrated lesson! It’s defined as: An approach to teaching in which students construct and demonstrate understanding through an art form. Students engage in a creative process which connects an art form and another subject area and meets evolving objects in both. According to Americans for the Arts, a curriculum rich in arts integrated activities has been linked to across the board achievement and retention increases. These achievements have been shown to benefit the student even after they leave a classroom utilizing arts integration. Research suggests that the link to increased retention is due to the fact that each time a student uses information in a new and different way, they embed the information slightly more into their brain. The Common Core’s focus on learning content deeper instead of increasing content seems to easily mesh with this idea and offer ample opportunity for integrating the arts into the classroom. 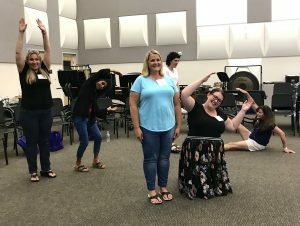 Over 100 Sarasota County teachers participated in the 5th annual Any Given Child Arts Integration Intensive on June 5 & 6. Teachers studied with Kennedy Center teaching artist Sean Layne focusing on his Acting Right Workshop- classroom management through drama. Sean’s workshop takes the foundational elements of acting such as concentration, cooperation, and collaboration and creates a structured process, which can become the basis for effective classroom management every day. He also worked with teachers on exploring a process to create arts integrated topics. Passing by a classroom you could see teachers twisted into shapes that represented a number solving math problems, or exploring outer space using multiple art forms; moving, painting, or creating tableaux. Teachers had the opportunity to share ideas and create science, language arts and social studies arts integration lessons using multiple art forms.